Auckland, New Zealand – 10 March 2016 – New Zealand’s video games industry has today registered another year of double-digit growth, with sales of interactive entertainment games hitting $392 million in 2015. According to research released by the Interactive Games & Entertainment Association (IGEA), total interactive entertainment sales were up by 13 per cent from 2014. Traditional retail sales increased by 4.5 per cent over 2014’s results to reach $136 million, and digital sales increased by 18 per cent to reach $256 million. 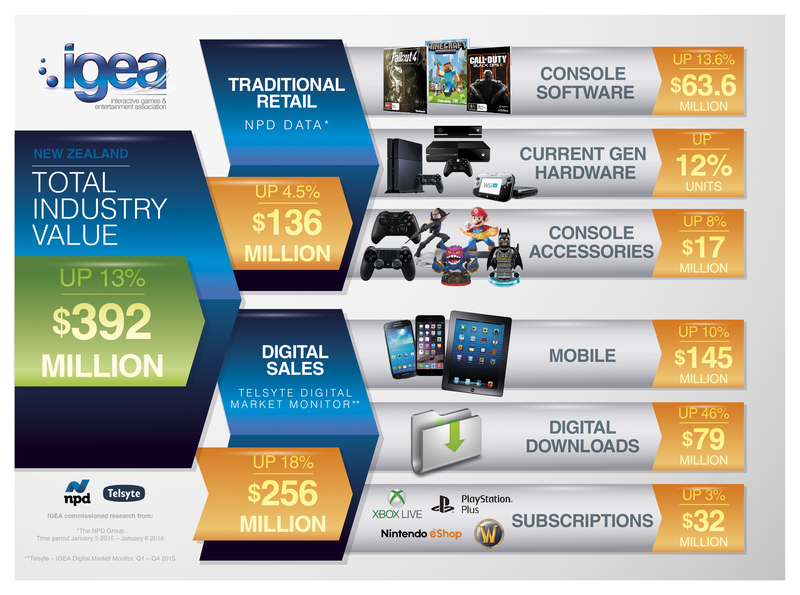 The interactive games market is comprised of hardware, packaged games, subscriptions, digital sales and mobile games. 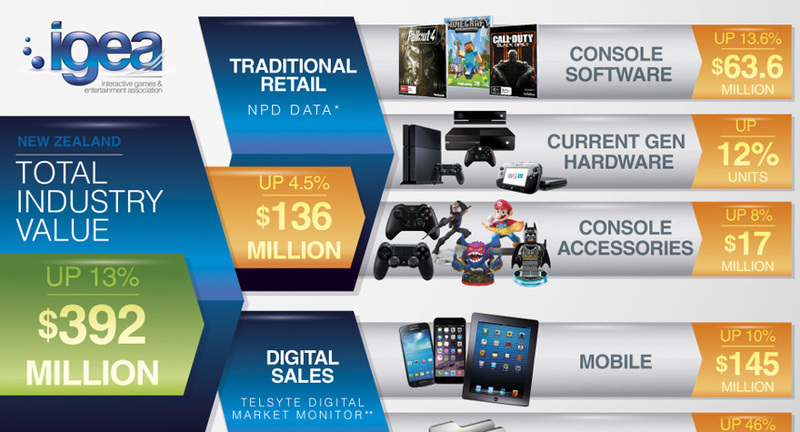 Market data from NPD Group attributed the steady growth of software and ancillary products, including accessories, interactive toys and games, and subscription cards, to the rapid adoption of the current generation console hardware. Additional research on the digital games market commissioned by IGEA was supplied from analyst firm Telsyte for the third year running. Its research confirmed that the popularity of the current generation consoles had led to increased digital game downloads in 2015. Similarly, PC game downloads also increased while mobile games continued to make up the largest segment of the digital games ecosystem. “The robust growth of New Zealand’s video games industry is testament to a strong gaming culture. Telsyte’s research shows that New Zealanders are keen on early access to games, with one in four buyers willing to pay in advance to play a game before the official release date. While there is no doubt that there has been diversification in the games market, retail sales were also strong,” said Ron Curry, CEO of IGEA. The ubiquitous availability of games and games content is very much the bedrock of the industry’s growth, along with consumers’ enthusiastic engagement across a wide variety of devices. The increased growth across the bulk of sectors, most notably within console and mobile gaming, offset a slowdown in areas such as hardcopy PC games. The innovation and variation within the industry stands it in good stead for further growth as the world’s largest entertainment industry for years to come. “The New Zealand interactive games industry continues to flourish on all fronts cementing itself as a key segment of the entertainment industry. New Zealanders’ appetite for digital downloads of full games has grown strongly and is set to make up around a third of all games sales by 2016,” said Foad Fadaghi, Managing Director, Telsyte. Strong console hardware sales had a flow on effect to other areas, the total console accessories market grew in value by 8 per cent over 2014 and total Software increased 9 per cent compared to 2014. IGEA has provided a review of the state of the video games industry in New Zealand since 2009 using commissioned research from NPD Group New Zealand. With the rapid growth in downloads and mobile gaming, the NPD data has been augmented with research from Telsyte to provide a complete view of the New Zealand interactive games and entertainment industry. The IGEA is an industry association representing the business and public policy interests of Australian and New Zealand companies in the computer and video game industry. IGEA’s members publish, develop, market and/or distribute interactive games and entertainment content and related hardware including mobile and handheld games.